This entry was posted in cognitive psychology, i-o psychology. Bookmark the permalink. 3 Responses to Do You Know What You’re Saying With Your Business Cards? My question is how best to handle the business card scenario when you work for a company that dictates to the nth degree what your business card must look like? Do I write something on the back, put a label on each with something unique? What options could I utilize? Most of the organizations I’ve worked for haven’t taken advantage of two-sided printing on their cards citing cost as the issue. 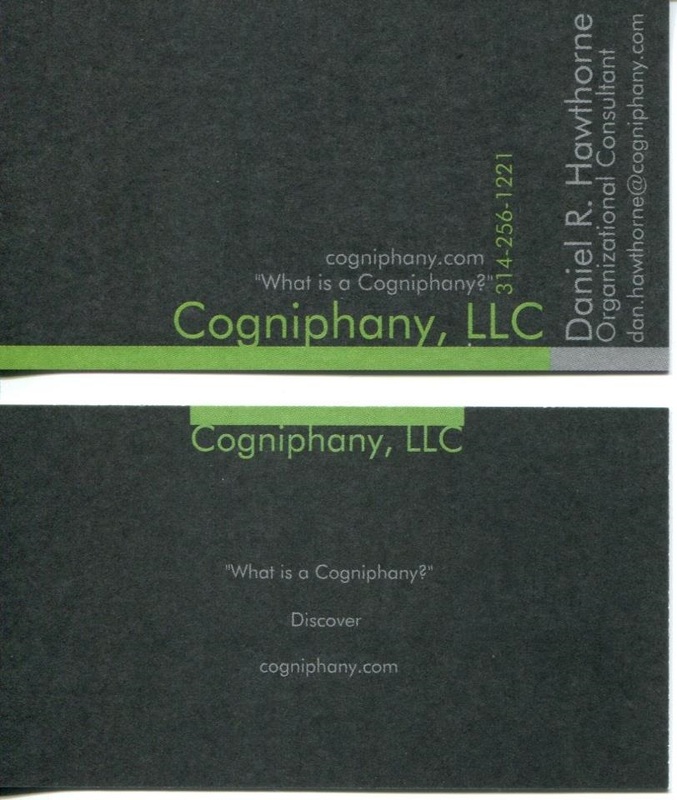 Silly as two-sided printing on a business card is super cheap and a great investment if used strategically. Thus, I have a blank slate on the back of my boring corporate card that I can perhaps use to my advantage. That’s a conversation I wish I could have with every single business out there. There’s a concept called signal theory, and it’s incredibly strong in things like this. Basically, since we have our automatic mind handling a huge amount of our sensory perception, it picks up on and processes a lot of information that we never even register consciously. That’s why you can influence a conversation toward sports by putting something like a “Sports Illustrated” magazine in a room without anyone even noticing its there. Thus, the mind picks up on themes very strongly. So, when a business does something like makes every single business card look the same, except for the contact information, it is transmitting the impression of stability, permanence, etc. But, it’s also causing the business card–a networking tool–to be completely short-circuited, because they’re all too similar. There is no way to distinguish one from the other. That’s why the best businesses at this give employees some measure of choice about what they hold. Some will allow for different colors or different positioning of the name, or different things on the back. they keep it all within their brand manual, but they allow for some flexibility to make their employees able to stand out in the minds of the people they interact with. …just to catch that person’s attention and make them remember who you were. When you’re networking, it’s like speed-dating. You’ve got only a couple of minutes to make someone remember who you are. Your words do that. The business card is the physical representation to link the memory of what you said to how to get in touch with you. The stronger you can make that connection in another person’s mind, the better. For some reason, it seems that most organizations, especially large ones, have gotten away from apply marketing concepts for branding and strategy to their business cards, letterhead, envelopes, etc. and simply made everything generic and cookie-cutter in their quest for control over the brand. As a result, they completely betray the entire concept of branding that we learn in Marketing 101. Very frustrating to those of us who are charged with marketing/sales/promotion/ fundraising, etc. Mostly, I’ve used the back to write something on my cards before I go to a luncheon/conference or to at least do it in front of the individual before I hand it to them. At a big event that isn’t always practical, but if I write it while with the person, they are so curious they have to read it and I hope it feels personal and like it’s meant just for them.